Why are mathematicians drawn to art? How do they perceive it? What motivates them to pursue excellence in music or painting? Do they view their art as a conveyance for their mathematics or an escape from it? What are the similarities between mathematical talent and creativity and their artistic equivalents? What are the differences? Can a theatrical play or a visual image capture the beauty and excitement of mathematics? Some of the world's top mathematicians are also accomplished artists: musicians, photographers, painters, dancers, writers, filmmakers. In this volume, they share some of their work and reflect on the roles that mathematics and art have played in their lives. They write about creativity, communication, making connections, negotiating successes and failures, and navigating the vastly different professional worlds of art and mathematics. I have always admired the abstraction ability of composers. The ingenious construction of beautiful patterns that can evoke such powerful emotions seems nothing short of magical. While mathematicians too construct beautiful patterns, I fear that few outside the math community appreciate that beauty or find any magic in it. I hope that this wonderful collection of articles, written by mathematicians who are themselves artists, will help better explain the many varied connections between mathematics and the arts, and illuminate better the beauty and magic in math. Much has been written about the close relationship of mathematics and music. It is a rather one-sided affair because mathematicians are usually very musical while musicians—including myself—are considerably less knowledgeable on matters of science. However we are all eager to learn from each other and the present volume is a most valuable contribution to this interesting dialogue. Creativity, Originality and Imagination are three common features of mathematicians and artists. 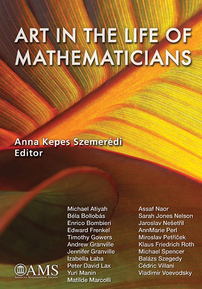 This inspiring book contains much more about the similarities between art and mathematics, as described by outstanding mathematicians with a wide range of artistic interests. Mathematics and art are intertwined on so many levels… It is exciting to see such a broad treatment of this important theme. Undergraduate and graduate students as well as research mathematicians interested in relations of mathematics and art. This is a rich, varied, and fascinating book. I urge anyone who is interested in both art and mathematics to read it. Or, if you are just interested in mathematics, this book could kindle an interest in art. And vice versa... Ultimately, art and mathematics have very similar goals: understanding the world around us more deeply, exploring new means of expressing ourselves.